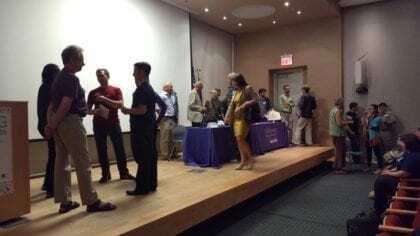 The 2017 North America Basic Income Guarantee (NABIG) Congress was held June 16-18 in New York. Some papers are now available online. The annual NABIG Congress is jointly organized by BIEN’s North American affiliates, the U.S. Basic Income Guarantee Network (USBIG) and Basic Income Canada Network (BICN). In 2017, the 16th NABIG Congress was held at Hunter College’s Silberman School of Social Work in New York, New York, from June 16 through 18. The event was the largest NABIG Congress in its history, drawing over 100 attendees and featuring over 50 speakers. Keynote speakers including Frances Fox Piven (Distinguished Professor of Political Science and Sociology, CUNY Graduate Center), Andy Stern (former President of SEIU), Juliana Bidadanure (Assistant Professor of Philosophy at Stanford University), Joe Huston (Give Directly), and Chris Hughes (Facebook co-founder). Plenary sessions were also held on Welfare Rights and the basic income movement in Canada, including the guaranteed minimum income pilot soon to be launched in Ontario. The 2017 NABIG Congress also featured two musical performances. Singer-songwriter Brandy Moore revisited her song “Just Because I’m Alive,” which she originally performed at the 2016 NABIG Congress in Winnipeg. Additionally, John Mize closed the conference by performing his new song “B.I.G.” with his son. A full schedule of the event can be viewed here. For additional perspectives on the congress from participants, see “(IDEA/Child Find)+ Basic Income = Equity” by Chioma Oruh (June 20, 2017) and “Recap: North American Basic Income Guarantee (NABIG)” by Ryan M Harrison (June 20, 2017). Additional papers may be uploaded later.